I was expecting rain this morning, so when I woke up to clear skies I was thrilled to be able to get in an outdoor run. When I neglected to think of was that a threat of rain meant crazy humidity! Add that it was already 80 degrees at 6am and my run was at a big disadvantage. I intended on doing 7 or 8 miles and my mind was totally in it, but my body was starting to give out. Around mile 4.5 I took my first walking break and ended up taking 2 more after that. I ended up completing a little over 7 miles and my pace was still 9:22 which I was surprised about. 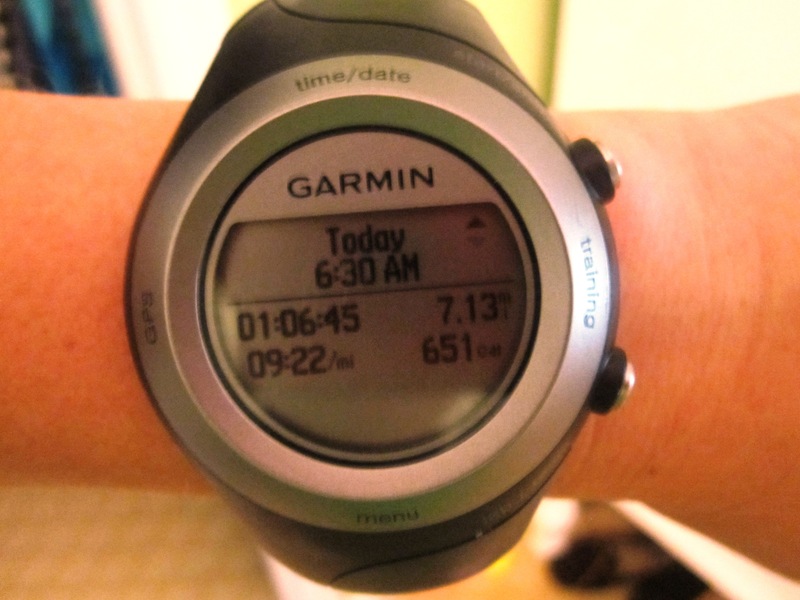 This run was a definite struggle, but it’s the tough ones that make us better runners. 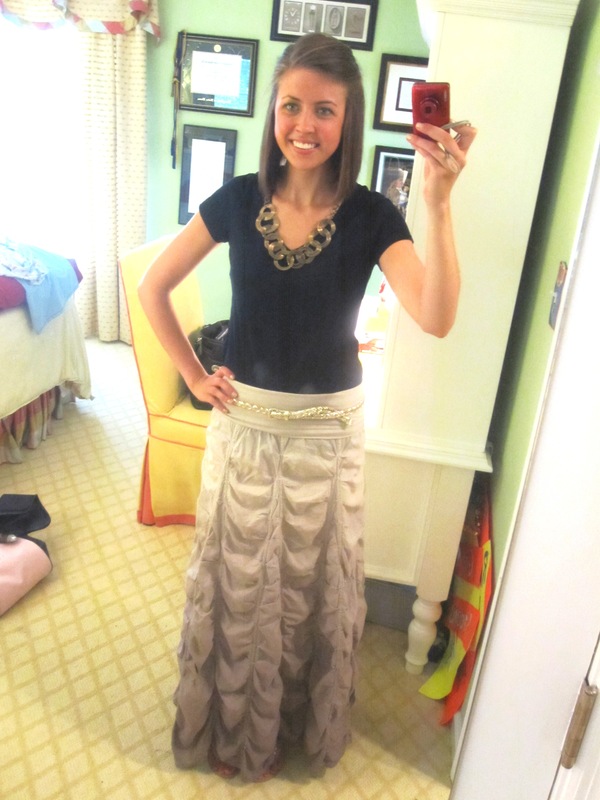 I guess I was feeling the long dress thing after buying the maxi-dress from H&M yesterday. I was actually sold this skirt as a tube dress, and sometimes wear it that way, but decided to go with the skirt version today. 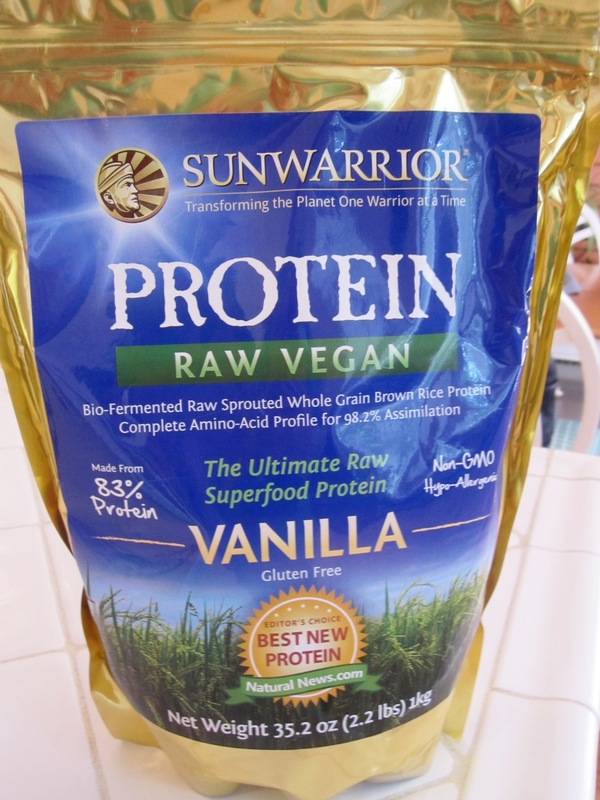 Today’s breakfast cookie was my first time trying my new SunWarrior protein powder. I’d been using Jay Robb Vanilla Whey, which I adore, but decided to experiment with everyone’s favorite SunWarrior when The Fitnessista had a OpenSky promo. 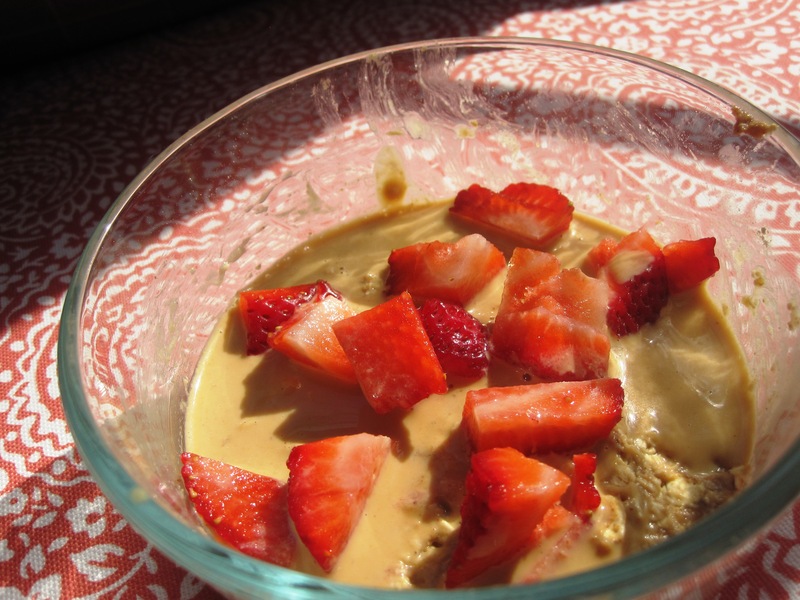 Peanut flour sauce and a strawberry on top. Honestly? I thought it tasted a little chalky. It was still good but I could tell a difference. I’ll definitely keep using it since I have that massive bag and I’m sure I’ll get used to it. Excited to try it in other recipes! My mom isn’t sold on the idea of protein powders. She thinks that coming from someone that is so focused on eating a healthy diet, I should be able to get all the nutrients I need without supplements. I agree to an extent, but have told her I use this as a helpful addition instead of viewing it as a necessary way to get my protein. I really love oats for breakfast and it’s hard to get a significant amount of protein in them. Even with nuts or nutbutter, the protein count isn’t very high. So while I could most definitely get all my protein from whole foods (beans, Greek Yogurt, tofu, quinoa, lentils etc), I choose to use the protein powder so that I can still eat some of the other foods I love! Do you use protein powder? How do you use it? I use Allmax Allwhey protein in chocolate or vanilla. I mainly use it in smoothies to give them that extra staying power or in Fitnessista’s cookie dough breakfast cereal. I just tried Sunwarrior for the first time too! I thought it was good but yes, a little chalky- but the chocolate flavor was great. The only other kind I’ve tried is the Amazing Grass Chocolate which I just cannot get used to- the taste is just kind of gross haha. And I understand what your mom is saying, but I think as long as it is used to supplement a healthy diet, I think it’s a good thing. I think it becomes a problem when people use it as their main source of protein. I feel the same way about protein powder–it let’s me eat a meal or two a day without thinking “Should I add an egg white to this?”! I love adding protein powder to oats, pancakes, and smoothies! My current powder is Body Fortress, i have vanilla and chocolate. I need to be on the lookout for a cleaner powder, though…maybe i’ll try Sun Warrior! After reading several less than exciting reviews I’m glad I haven’t spent the money for Sunwarrior. I put protein powder in my smoothies. Not sure what else I would put in a smoothie to get protein? I’m not going to eat raw eggs! I’m a huge protein powder user, but I buy New Zealand sourced whey (no hormones- it’s their standard!) that is sweetened with stevia instead of sucralose. It’s not a whole food by any means, but it’s one of those gems in my diet that I won’t get rid of so I found the best possible option! I really wanted to try Sun Warrior (I’m looking for a good vegan protein) but I keep hearing that it’s just as chalky as the ones I have right now. Bleh! My dad would never be sold on the protein powder idea. He thinks it’s just too expensive and unnecessary if you can just EAT things with protein in them. Yes! Always a whey protein and fruit shake after a workout. I find if I don’t, I am way behind in my daily protein goals. I mean, I’d have to eat 4 eggs as a snack to get the same protein content. Also, I’m usually running from a workout to a class to a client and find it’s the only thing I can get down in the time I have available (and can eat while I’m driving!). I also use it in baking; healthy cookies and protein bars. I prefer my own concotns to the ones you buy in a store. My whey protein of choice is Sisu, French vanilla! I also use it in baking; healthy cookies and protein bars. I prefer my own concoctions to the ones you buy in a store. Sorry for the double post; slow iPad, impatient me! I make a smoothie out of it with: 1 scoop protein powder, 1 cup almond milk, 1TB Cashew Butter, and pour it over chopped strawberries… makes for a strawberry-vanilla-power-morning-soup! It’s delish… and it tastes more dessert-y than a typical breakfast would. Sometimes those runs happen and when they do, they do make us stronger runners! haha your mom would kick me out of her house if she saw the amount of protein powders i have! 5 tubs haha. i don’t mind it though because i LOVE them! i’ve never bought sun warrior before and probbbably won’t haha i just feel like it’s so expensive! I just received my Sun Warrior and LOVE it! It took me a few tries to get used to it but now I absolutely love it.